There are thousands of aviation-related Web sites out there, and some of them contain information about warbirds and vintage aircraft. Some of this information is valuable and some of it is... well... less valuable. We've taken the time to link to some of the good stuff, and we hope you'll use this page as an additional resource when you need more research material. Have fun! Aerial Reconnaissance Archives, Photos from WWII, archived at Keele University, UK. Aerofiles -- An extraordinarily detailed aviation historical reference site. Air Force History Index.org -- Search over 550,000 US Air Force documents online. ArmyAirForces.com -- An excellent WWII reference site that includes an active forum. CrashPlace -- An online database of WWII aircraft crash sites. Demobbed -- Out-of-service British military aircraft. Duxford Times -- Airfield news and information. Fleet Air Arm Archive -- Comprehensive Royal Navy history database. Flight Global Archive -- Huge archive of articles and images from 1909-2005. Flight-History.com -- Archives of historic photographs, stories, aviation artwork and more. Fuselage Codes of WWII -- Flying training field fuselage codes used on WWII aircraft. Globemaster "Tailcodes" Page -- Interactive database of military aircraft data. Kilroy Was Here -- "Unknown Stories and Forgotten Places of WWII." Lost and Found Aviation Sounds -- "Preserving the sounds and voices of aviation's past, present and future." Military Aircraft Incident Reports -- U.S. military aviation accident / incident database. On Camouflaged Wings -- "Issues and aircraft that have shaped military aviation." Preddy Memorial Foundation -- Honoring the Preddy bothers, both lost in Mustangs in WWII. Project "Get Out and Walk" -- An amazing history of ejections around the world. This Day In Aviation -- Important dates in aviation history. Thunder and Lightnings -- British postwar aircraft and more. UK Air Accidents Investigations Branch -- Searchable database of civil aircraft accidents and serious incidents in the UK. USAF Installations Database -- A history of US Air Force airfields. UK Serials -- UK Military Aircraft serial number allocations. WASP-WWII Website -- A chronicle of the Womens Air Service Pilots organization. Wings Palette -- Extensive database of aircraft markings. Abandoned and Little-Known Airfields -- A wonderful website detailing ex-airfields of the United States. ABMM, Australian Bunker and Military Museum -- "Exploring Australia's forgotten wartime history." Aero Archeology -- "Dedicated to the discovery, recovery and preservation of WWII aircraft." AeroCollector Magazine -- UK-oriented collectors' resource. AeroLocker -- Rare and unique aircraft parts and memorabilia. Aeronautica Plus, Colorado Springs, Colorado, USA (E-mail link) -- Flight and maintenance manuals. Aircraft Maintenance and Regeneration Center (AMARC) -- Davis-Monthan AFB, Arizona, USA. 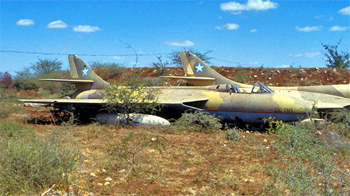 Aircraft Wrecks in the Mountains and Deserts of the American West -- Pat Macha's interesting site. Alex Panchenko -- Soviet/Russian aviation collectibles. American Story Aviation Marketing Group -- Warbird parts and miscellanea. AMARC Aircraft Inventory List -- A directory of aircraft stored in the desert at Davis-Monthan AFB, Arizona. Aviabid -- Online aviation auctions. Aviamonuments.ru -- A Russian-language site with photos of display-aircraft mounted on poles throughout Russia. AviaScan Group -- Aircraft recovery in northern Russia, including Ju-88 and Yak-9. Aviation Archaeological Investigation & Research (AAIR) -- Over 100,000 accident reports on file. Aviation Archaeology Site (Europe) -- Excellent site by Simon Parry. Aviation Archaeology Website -- News and information about the status of many warbird wreck sites. Avko Inn -- Russian aviation and space helmets and gear. B&J Aircraft -- Warbird parts and collectibles, from WWII through the early days of jets. Barnstormers.com -- The standard-setting site for collectibles, memorabilia, wreck-chasing, aircraft and parts for sale, etc., etc. Battlefield Relics -- East German memorabilia. Occasionally has aircraft parts. Belgian Military Aircraft Wreckhunters -- Information about Belgian military aircraft wrecks and relics. Beverly Hills Air Force -- Decommissioned B-52s and parts. BoneYard2U -- Sales of aircraft parts and collectibles from the "bone yard." British Aviation Archaeological Council -- Official national body in the UK for aviation archaeologists and researchers of military crashes. Canadian Dept. of Nat'l Defence -- Disposal, sales, artifacts, loans. Canadian Harvard Aircraft Association Dive Recovery Team -- A group that locates and recovers historic aircraft in Ontario waters. CF-CPA Lodestar Recovery -- A project to recover a Lockheed C-60 Lodestar from northern Quebec. Check Six -- Wreckchasing information and memorabilia. Corke Aero -- All sorts of interesting aviation artifacts. Depot 41 -- History of Kingman Army Airfield, Arizona, where thousands of WWII aircraft were stored and eventually scrapped. Document Engineering Co. -- Flight manuals. eHistoryBuff.com -- Original historical autographs. Flug Archiv 20 -- Super high resolution aircraft plans, aircraft blueprints, aircraft manuals, books and photos. FlyingZone's Aircraft Preservation Scene -- Lots of information on historic aircraft preservation activities in the U.K.
Flyvrak -- WWII Aircraft wreck sites in Norway. Garcia Aviation Co. -- Online catalog of aviation and military collectibles. Gertrude Tompkins-Silver Expedition -- The search for the last missing WASP, whose P-51 crashed off the California coast in 1994. Glenview Hangar One Foundation -- NAS Glenview historical group. Historic Aircraft Co. -- Free classified ads for vintage/historic aircraft, parts, and artifacts. Holdek Aviation Collectibles, Poland -- Flight suits, helmets, miscellaneous equipment, and even airplanes. International Cockpit Club -- An organization serving collectors of aircraft cockpits and partial airframes. KW Salvage -- Los Angeles, California based firm that occasionally auctions wrecked warbirds. Lancashire Aircraft Investigation Team -- A UK-based archaeology organization. Lostflights -- Historical aviation studies and research. MIA Recovieries -- Clayton Kuhles' organization, devoted to locating downed WWII aircraft and crews in Burma, India, Bangladesh, and China. Midway Atoll Corsair -- A SCUBA diver's report on an underwater treasure. Military Info Publishing -- Military manuals. Oklahoma Wreckchasing -- Preserving aviation history through archaeology. P-38 Crash Site -- Previously restricted photos of wrecked P-38 Lightnings. Pacific Wrecks Database -- Information on aircraft wrecks in the Pacific Theater. Extensive forum. "Planes on a Stick" -- A photo record of many of the military aircraft displayed on poles in Canada. QuestMasters --	The foundation for the recovery and preservation of World War Two memorabilia for posterity. RareAviation.com -- Documents, manuals, photos, films and more. Sea-Tech Exploration -- Wreck-diving and aircraft recovery. Skynet Aviation Aircraft Parts -- Collectibles and memorabilia. The Stuffinder -- Aviation memorabilia. USSR Airspace -- Soviet/Russian authentic collectibles. Victory Air Museum -- Photos from a long-gone private collection of warbirds in Mundelein, Illinois, USA. Warbird Relics -- Parts and collectibles. Warbirds Restoration -- Spitfire engineering drawings. Wisler, Jay -- Warbird parts and memorabilia. Wreckchasing -- Nick Veronico's comprehensive site on historic aircraft archeology. WWII Aircraft Parts.com -- All sorts of aircraft parts, from propellers to instruments. Aero Vintage Books -- Wide selection of aviation books. Aeroplane Monthly -- "The world's most widely respected historic aviation magazine." Air Enthusiast magazine -- Historic aviation journal from the UK. Airlife Books -- Aviation books on the Web. Aircraft Illustrated magazine -- "The UK's best-selling modern aviation monthly." Aircraft Records -- Airplane sounds on CD. All Aviation Flightline Online -- Air racing online magazine. All Red Star -- Information for operators of Eastern-bloc aircraft. Amazon.com Warbird Books -- Warbird books from the world's largest online bookstore. APVW -- Alex Waning's aircraft photography and videos. Avialogs -- Downloadable aircraft manuals, plus photos and news. Aviation History magazine -- Well-researched history articles. Part of a much larger history site. Aviation Nut -- Web magazine. AvWeb -- One of the Internet's most popular online aviation magazines. Belle & Blade -- Military aviation war films and videos. CAV Video Productions -- Aviation videos. Classic Wings Magazine -- High-quality warbird magazine covering Australia/New Zealand. Cobras Over the Tundra -- Everett Long's book about flying Kingcobras and Airacobras through Alaska and Russia during WWII. Duxford Times -- Airfield news and information about Duxford Airfield, Cambridgeshire, UK, one of the world centers of warbird activity. eFlightManuals.com -- "The leader in CD-based flight manuals for the military Warbird community." Also offers originals and photocopies of various manuals. Essco -- Manuals of all kinds: Flight, parts maintenance/structural manuals, etc. F4 Aviation Webzine -- Web magazine with great photos. Flug Revue Online -- Excellent German aviation magazine. Flyingbooks -- Aviation books bought and sold. FlyPast -- "Britain's Top Selling Aviation Monthly." Your Editor's personal favorite, FlyPast is a fascinating monthly look at classic and warbird aviation. Ghost Wings -- An excellent student-produced magazine from Montoursville High School, PA, USA. Ghosts -- WWII Aviation photo book. Gray Eagles -- "A touching documentary about a humble WWII Mustang ace, his grandchildren and the bond that is formed when history comes alive." The Heavenly Body -- A novel about B-25 crews in the South Pacific by Robert E. Shanks. Historic Wings -- Internet aviation & pilot's magazine. Honor Squadrons International -- A US Public Broadcasting Service (PBS) TV project, soon to be a major, 10-hour series shot in High Definition video. An extraordinary project! Jarlsberg, Norway Warbird Music Videos -- A page full of streaming music videos, including warbird flying. Jeff Ethell -- WWII in color, books, info. Jets Press -- Fighter-jet aviation books written by fighter mechanics. Lost Birds -- Web magazine. Military Aviation Movie List -- Interesting background notes compiled by Marshall Cram. Moen Aviation Books -- Warbird flight manuals. Newport Aeronautical Sales -- An extensive library of Technical Orders and engineering drawings. OldManuals.com -- WWII aircraft technical orders, pilot manuals, and related documents on CD-ROM. Planes and Pilots of WWII -- Online aviation history magazine. Planes TV -- "The future of aviation entertainment is on the Web." Pylon1 -- Air racing online magazine. Sentry Aviation News -- Web magazine; good photos. SkyFire Videos -- Warbird and Reno air race videos. Southern Aviator -- A sport aviation newspaper for the southern USA. Take Flight Video Productions -- Makers of the "Real Life Aviator" video series. The Restorers -- An extraordinary documentary film about warbird owners and restorers. Warbird Aero Press -- "The Art, Action and Adrenaline of Unlimited Air Racing." Warbird.at -- A warbird-related Web e-zine with interesting graphics and design. Warbird Digest -- The magazine for warbird enthusiasts. Warbirds Stories -- Online warbird information and discussion. Warbird Index -- The International Register of Historic Warbird Aircraft, featuring WarbirdTorque, a warbird discussion forum. Warbird Radio -- Live internet radio, featuring interviews and stories of interest to warbird fans! World Airshow News magazine -- "The Trade Magazine For The Entire Airshow Entertainment Industry." Zeno's Warbird Video Drive-In -- WWII aviation training films, streamed real-time on the Internet. The AeroNut -- Tom Cleaver's excellent air-to-air photo site. Aircraft Photographs and Air Displays -- Roger Whitcomb's archive of military aviation photography, mostly from the UK. Aircraft Walkaround Center -- Robert Lundin's detail photos. Airshow Action Photo Gallery -- Peter Steehouwer's collection of more than 1500 high-quality aircraft photos. AirTeamImages.com -- Huge online commercial image library. Air To Air -- Paul Bowen's award-winning aerial photography. Australian Aviation Archive -- Photos of aircraft which have served in Australia. AviationImages.net -- Extensive aviation photo archive. Aviation Photo Digest -- "Capturing the aircraft, sites and stories." Aviaworld -- Military aircraft photo gallery. Av Illustrations -- Military aircraft illustrations from Robert Basile. Boeing Photo Store -- Historical aviation and aerospace-related photos from Boeing's massive archive. Classic Wings -- Adam Reiss' excellent photo collection. Cloud 9 Photography -- "For excellent airplane photos, this is the place!" F4 Aviation Webzine -- High-quality photos. Fence Check Aviation Photography -- Photography, forums, news, and more. Fighter Writer's Briefing Room -- Jeff Ethell's "WWII in Color" Pictures. Focal Plane Images -- Featuring Darren Harbar's excellent aviation photography. Foto Search Stock Photos -- Over 800,000 stock photos available. Fred's Boring Pictures -- C. Fred Smith's decidedly un-boring warbird photography. Frisan Aviation Photos -- Miscellaneous photos, primarily Eastern Bloc aircraft. Futurshox.net -- Jo Mitchells' great aircraft photo site. GearUpSix -- Dan Sheehan's excellent warbird photography. Glen Haas Photography -- Nice warbird photography and art prints. Handmade By Machine -- Software, Embroidery and Photography. High Flying -- Includes a great photo archive. Images of Light and Lift -- Scott Germain's professional aviation photography services. Imagination Ink -- Performs photo restoration, and provides photo recreations and collages. International Aviation Photography Agency -- Antoine "Twan" Roels' commercial photography. Kanava Graphics -- High-quality aviation photography and more. Kiwi Aircraft Images -- A great resource for detailed photos and aircraft histories. Larry Grace Photography -- Commercial photographic work, including aviation. Max Air 2 Air Pictures -- Max Haynes' highly-enjoyable aircraft photography. Mistral Images -- Featuring the aviation photography of Eden Harriss. Muche's Warbirds -- Photography from Lani Muche. National Archives' WWII Naval Photo Archive -- Over 14,000 color photos from WWII. Neil's Pics -- Neil Rogers' photos from the Duxford "Flying Legends" airshow. Once, We Ruled the Skies -- The aviation photography of Britt Dietz. Pegase Airshow Pictures -- A great selection of excellent photography. PlanePix -- Over 1,000 aviation images available. Photoz By Liza -- Nice aviation photography; prints available. Protito.com -- Aviation photography by Henk Tito. Rare Aircraft Scrapbook -- Unusual aircraft from WWII. Skytamer Images -- Photos, aircraft data, military markings, and more. Skywolf's Lair -- Lots of good WWII aircraft photos. Sleeping Giants -- An extraordinary photo-essay about the aircraft boneyard at Davis Monthan AFB, Arizona, USA. Stephen Rister's Warbird View -- Nice air-to-air warbird photographs. Tom Royal Warbird Photography -- Great photos from around the warbird circuit. Warbirds of the World -- Small selection of airshow photos. Warbird Images -- Moose Peterson's amazing warbird photography. Warbird Photography by Gerry Herft -- Beautiful, professional warbird photography. Warbirdz.net -- Over 5,500 excellent warbird photos, many from Australia & New Zealand. Wings, Wheels and Anchors -- Military photo CDs available. Aero-Fotografik -- High-quality aviation photo prints. Aurora Art Company -- Andy Wenner's aviation art prints. Avart -- "Aviation Art on the Internet." Aviation Art Hangar -- "Fine aviation art from aviation enthusiasts, for aviation enthusiasts." Aviation Shoppe -- Aviation blueprint-art and more. AvionArt -- DC-3 wingtip executive desks, propeller art, nose art, and more. Barewalls.com -- Large selection of aviation posters and prints. Blue Sky Galleries -- WWII-themed aviation paintings and artwork. Craig Purdie Images - Digitally-enhanced photographic fine art. Custom Nose Art -- Personalized nose art inspired by the aircrew art from WWII. Discount Aviation Art -- "Your Source for Aviation Art Prints and Posters." Flight History -- Features the works of several noted aviation artists. Flying Colors Glass -- Custom stained-glass, featuring aircraft designs. General Ray Davis -- Custom photo mosaics and more. Geoff Nutkins -- RAF, USAAF, and Luftwaffe artwork, including signed prints. Ghosts -- Full-color warbird photo calendars. HawaiianEyes.com -- Carries several nice WWI and WWII aircraft paintings. Little Aeroplane Factory, The -- Aviation artwork, figurines, signs and more. Motor Art Works -- Aviation art favorites from WWI to the present. Old Glory Prints -- Aviation artwork from dozens of artists. Pete Wenman -- UK-based aviation artist. Stellar Images -- Stained-glass warbirds. Ted Williams Aviation Art -- Aviation art and showcase prints. Warbird Central -- High-quality bronze monumental warbird statues. Warpaint LLC -- Vintage aviation gear and photography. 3D Warbird Shirts -- Silk-screened warbird shirts with great artwork and a unique, 3D look. Ace's Discount Pilot Shop -- Pilot supplies, flight gear and aviation accessories. Aero Leather Clothing, Galashiels, Scotland -- Original and reproduction leather jackets and other products. Aeromiltec -- Aircrew safety and survival equipment. AirGear.net -- All types of pilot supplies, shipped worldwide. Aviation Leathercraft, Andover, Hampshire, UK -- Leather jackets. Aviation World, Toronto, Canada -- Pilot supplies, books, hobbies. Bell's Aviation, LLC -- Vintage Army Air Corps, US Navy, and USAF flight gear, clothing, and equipment. Best Glide Aviation Survival Equipment -- Carries a huge selection of high-quality survival equipment. Buzz Rickson Products -- Nylon flight jackets. Check 6 Aviation -- Military flight gear. The Chuting Gallery -- Parachutes. Cockpit USA -- Leather jackets and vintage-style apparel. Combat-Tee.com -- Nose-art and military T-shirts. Doppeldecker Aviation Clothing -- Aviation-themed ties, shirts, scarves, and more. Eastman Leather Clothing, Ivybridge, Devon, UK -- Leather flying gear. FlightJacket.com -- Authentic WWII-spec leather jackets and nose art. Flight Gadgets -- All types of pilot supplies. Flight Suits, (Gibson-Barnes), El Cajon, CA, USA -- Helmets, flight suits, gloves, boots, etc. General Ray Davis -- Leather flight jackets and leather squadron patches. Government Sales, Inc., USA -- Helmets, flight suits, boots, etc. Grambo, Inc, El Cajon, CA, USA -- Parachute repacking and related services. King Schools -- Pilot training courses and supplies. Lost Squadron -- Warbird-related T-shirts, hats and photography. Mart Aviation (UK) -- Flight suits, helmets, gloves, bags, etc. Merit Apparel Company, Inc. -- Manufacturers of protective gear. The Parachute Shop, Pepperell, MA, USA -- Parachutes. Quartermaster Supply -- Quality surplus Nomex gear, survival equipment. RAF Museum Shop -- Aviation clothing, pins, patches, etc. RYZ -- P-40 Warhawk-themed sneakers. Sportsman's Guide -- Flight gear, Nomex, etc. Sporty's Pilot Shop -- Pilot supplies of all kinds. Online catalog and ordering now available. U.S. Authentic -- Leather jackets, patches, nose art. Aero Auction -- European aircraft auction site. AeroGroup, Inc., Jacksonville, Florida, USA -- Contract aircraft available for training, testing, and movie work. AeroTraderOnline.com -- The Web version of the popular aircraft sales magazine. Aerovision LLC -- Canadair CF-5B and CT-133 sales. Air Assets, Inc., Lafayette, Colorado, USA -- Warbird sales, brokering, appraisals, acquisition, and consulting. Also handles Messerschmitt Me-262 replica sales. Air Capitol Warbirds, Wichita, Kansas, USA -- Warbird sales and contract work, with a strong emphasis on jet types. Air Investment, Blaine, Minnesota, USA -- Warbird sales and service, specializing in the L-29 Delfin jet. Aircraft Direct -- Free online listings, including occasional warbirds. AircraftSelect.com -- Various aircraft listings, including occasional warbirds. AirSwap.com -- Various aircraft listings, including warbirds. AirplaneFrenzy.com -- Aircraft listing site which often include warbirds of all types. Airplane Supply Centre, White Rock, BC, Canada, and Blaine, Washington, USA -- Usually has a few warbird aircraft and projects for sale. Astre Air International, Watkins, Colorado, USA -- Warbird imports, exports, rebuilding, remanufacturing, inspection, certification and training. Barnstormers.com -- Many classified listings for warbirds and related items. Bob Hannah Aviation, Caldwell, Idaho, USA -- Includes a diverse listing of warbirds of all types. Bulldog Aircraft Company, Florida, USA (also New Zealand) -- Dealers and importers of the Scottish Aviation Bulldog T1 trainer. Classic Aircraft Sales, Queensland, New Zealand -- Unusual vintage aircraft listings. Code 1 Aviation, Rockford, Illinois and Lakeland, Florida, USA -- Warbird sales, maintenance, restoration, and training. Courtesy Aircraft, Rockford, Illinois, USA -- One of the USA's leading warbird brokers. E-Disposals -- Website of the UK's Disposal Services Authority (DSA) which occasionally offers surplus aircraft. Everett Aero -- Sales and support of British ex-military jets. Falcon Wings Aviation, Gettysburg, Pennsylvania, USA -- General aviation and warbird broker. Global Air, Louisville, Kentucky, USA -- Online aircraft listings, including warbirds. International Jets, Inc., Gadsden, Alabama, USA -- Warbird dealer for L-39s, Iskras, etc. J.W. Duff Aircraft Company, Denver, Colorado, USA -- Good source of warbird "rebuild projects" and/or aircraft parts. Ken McInturff Aircraft Sales, Los Angeles, California, USA -- General aviation broker with warbirds occasionally in their inventory. Lancaster Aviation, Inc. -- The Canadian Government's representative for aerospace sales. Pride Aircraft, Rockford, Illinois, USA -- Warbird restoration, sales, parts and maintenance. Provenance Fighter Sales, Murrieta, California, USA -- Warbird sales. Public Works and Government Services Canada -- Occasional sales of surplus aircraft. Raptor Aviation, Kentucky, USA -- Warbird sales. Russian Military (Richard Moore Engineering) -- Russian and Eastern European vehicles for sale. Sandy Air Corp., Innsbruck, Austria -- Warbird restoration and sales. Sherman Aircraft Sales, West Palm Beach, Florida, USA -- Varied selection of warbirds and General Aviation aircraft. Vortex Aviation Engineering -- Belgian site that often has warbirds-for-sale listings. Warbird.at -- Warbird classified ads. WarbirdFinders.co.uk -- Warbirds for sale and warbird recovery. Worldwide Warbirds, Inc. -- Importers and dealers of L-39s, MiGs, etc. AeroplaneModel.com -- "Highly detailed aeroplane models for the discerning collector." Aerospace Jewelry -- Offers warbird pins and other related items. Aiken's Airplanes -- Die-cast metal collectible model airplanes. "AirNet" Links Site -- Howard Curtis' huge collection of aviation links. The Airplane Shop -- "The largest model airplane shop on the Internet." AirModel -- Die-cast, hand-finished metal aircraft models. AirSound -- Airshow commentary and multi-media production, based in the UK. Avemco Insurance Company -- Aircraft hull and liability insurance. Aviation Heritage, Inc. -- Books, CD-ROMs, 3-view drawings, etc. Aviation Models.com -- Desktop display models. Aviation Posters.com -- Classic aviation posters. Bill White Insurance Company (BWI) -- Aircraft insurance specialists. BomberGirl -- Aircraft nose art and photography. Classic Jet Simulations -- Software training solutions for classic jet warbirds. Copyzone Archiving Ltd. -- Thousands of warbird aircraft engineering drawings available online. Ejection Links -- A huge list of ejection and ejection-seat related links on the Web. Famous Fighters -- Detailed warbird drawings and technical data. The Flying Mule -- Highly-detailed, historically accurate die-cast model aircraft for enthusiasts and collectors. Howard Curtis' AirNet Links site -- A huge collection of aviation Web links. ImaginAir Designs -- Aviation-related rubber stamps. Jake's Wooden Toys and Collectibles -- Hand-crafted aircraft models. John Fry Aviation Postcards -- Postcards. Lance Aircraft Supply -- Vintage original "boots" and ESNA nutplates. Legacy Military Aircraft -- Die-cast model aircraft and more. Liaison Aircraft Forum -- Discuss liaison and observation aircraft, pilots, squadrons, restorations, and events. The Little Aeroplane Factory -- Mahogany and die-cast models, artwork, and more. Martin-Baker -- Manufacturers of ejection seats and escape systems. MerlinV12.com -- Collectors of Merlin engines and other interesting engines. Military Pins and Patches -- Aviation-related patches, pins, caps, insignia and more. Model Expo, Inc. -- Very high quality aircraft model kits. Motion Models -- Custom-made wooden aircraft models. National Warbird Operator Conference (NWOC) -- A yearly gathering of warbird owners and operators. Pacific Aircraft -- Mahogany aircraft models. Peach State Aerodrome -- "Where Old Aeroplanes Never Die," a center for vintage, classic, and warbird aviation near Atlanta, Georgia, USA. Plane Crazy Enterprises -- Aviation collectibles and patches. Plane Writing -- Quotes from early pilots' biographies. Replicas By Tyson -- High-quality wood aircraft models. Russ-Sell -- Plastic models of Russian aircraft. RAF at War -- Living history group and advisors to TV and film. Sanger -- Plastic model aircraft kits. Scalecraft Models -- A huge selection of hand-carved mahogany wood aircraft models. SimAviatik -- P-51 Mustang simulators. Spitfire Emporium -- Spitfire and aviation collectibles of all kinds. Stalag 13 Web Page -- Lots of links. Terrane Promotions -- Embroidered badges, pins, prints, etc. Thunder Builder's Group, LLC -- Manufacturers and suppliers of the Thunder Mustang, a P-51 scale replica. Trintec Industries -- Gifts for Aviators. UK Warbirds -- Links, information, and data on the British warbird scene. "Warbird Bob" -- There was a cat in New Smyrna Beach, Florida, who really liked warbirds. Yes, a cat. Warbird Fever -- An online effort to create a photographic record of every surviving warbird. Warbird Registry -- A site where warbird owners can enter their aircraft's data for historical purposes. Warbirds -- A Living Aviation Museum -- Mike Kopack's aviation photography. Warbirds Cafe at Teton Aviation, Driggs, Idaho, USA -- A warbird-themed restaurant with a great view of mountains and airplanes. Warbirds of India -- A comprehensive site covering warbirds on the Indian sub-continent. Warbird Information Exchange -- Perhaps the most active warbird discussion board on the Web. Warbird Network -- A social network for warbird enthusiasts. Warbirds Online -- News and commentary of the international warbird community. Warbirds Resource Group -- Various warbird-related topics and discussion groups. Warplanes Warehouse -- Mahogany aircraft models. Wings Over New Zealand Aviation Forum -- If it flies in New Zealand, it's discussed here. Got a link or a URL update for us? to make this a valuable resource.